Acorus plants and species are a clump forming grass growing from rhizomes, readily available for sale in Australia. Species include : Acorus ogon, Acorus calamus and Acorus gramineus and these are the three best known. Commonly called ‘Sweet Flag’ these are an ornamental grass that likes moisture through the year. Acorus is a clump forming grass or rush and as such prefers a damp position. Sprays of dark green and cream variegated leaves. Evergreen and a good plant for the edge of a pond or water feature. A good plant to grow around ponds and they can be grown in pots submerged in water features to add colour and interest. When container grown they will need to be divided every 4 – 5 years to prevent over crowing and improve the growth habit. A. calamus- Reaching around 80 cm in height with green foliage. 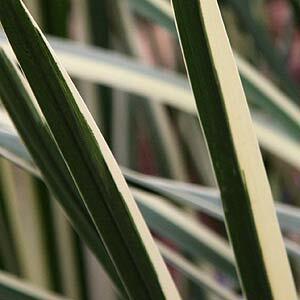 Also available as A. calamus variegatus with green and yellow showy foliage. A. gramineus -This is the Japanese sweet flag. Cultivars such as Acorus gramineus ‘Ogon’ with its lime green foliage are very popular. This variety will reach around 30cm in height. Aquatic and wetland plants. Waterlilies, cold tolerant lotuses, true water irises, pitcher plants. Growers and propagators of waterlilies, lotus, native and non-native aquatic plants.